The Edwards 6538-G5 24V Call For Assistance system is designed for areas where a call-for-help or an emergency switch is required. The kit consists of a Cat. No. 6536-G5 horn/strobe for audible and visual signaling, a Cat. No. 6537 emergency pull cord station, and a Cat. No. 592 transformer. Each component may also be ordered individually. 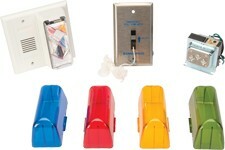 Use in health care facilities, public rest-rooms, and handicapped areas. The 6536-G5 Horn/Strobe is designed for use in a single gang 2" (51mm) x 4" (102mm) box located over the door. Each unit contains an audible horn signal which generates an 82 dBA sound pressure level at 10 ft. and a high intensity strobe.